Yesterday was a *rough* one...I was soooooo tired, from the moment I woke up, and I struggled all day long to just...keep on going. Welcome to summer, huh? Between the Denizens being off school, working, commuting, gardening and OH YEAH, putting up the results of same, which this weekend consisted of 4 quarts of cherries - not ours but farmers market scores - six pints of chili, four pints hickory-syrup baked beans, eighteen ears of corn blanched, vacuum-packed and frozen, and nine zucchini sliced and dried this weekend. PLUS, two loaves of bread, six dozen waffles, eight dozen pancakes, four pounds of bacon [mmmmm...baaaaaaacon....], a dozen cookies [last of the last frozen cookie dough], and three loaves of apricot-banana bread. OH. And? I have had to hand-water for going on a MONTH now, thanks to a leaking sprinkler valve, which led to trenches, which led to an enthusiastic new project for the husband involving moving lines around, which led to a ridiculous number of setbacks AND the house water having to be turned off for hours at a stretch over and over again which reminds me.....have I mentioned that the toilet in the master bathroom has also been out if commission for almost a month? Tomorrow, the new chest freezer arrives...I spent a couple hours Sunday cleaning-no-REALLY-cleaning the garage in honor thereof. And Saturday, I am taking a (roughly) four hour road trip! To pick up the (ahem) nearly 1,000 (yes...THREE zeros) of finished meat to fill it. 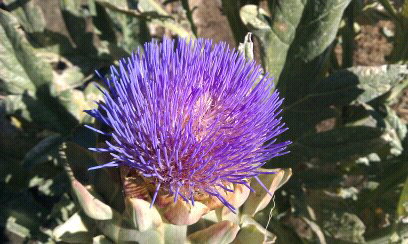 ...if you need me, I will be over here in the corner rocking back and forth, sucking my thumb...or, out in the garden admiring the artichoke blossoms. I intentionally let this one go to bloom because I wanted to know what they looked like...and now I do. Cool, huh? !